Friday’s July employment report is the big number this week. This indicator is a focal point for the Federal Reserve (Fed) and has been very erratic of late. The 6,000 job loss in May was shockingly poor, but it was followed by a better-than-expected 265,000 job gain in June. Will the real labor market please stand up? A Bloomberg survey reveals a street expectation of 171,000 jobs and a 4.8% inflation rate. Last week’s Gross Domestic Product (GDP) report showed an economy growing at just 1.2%. This headline figure will be revised further, but taken at face value, it indicates a growth rate below our 2016 forecast (2.25%). The current estimated growth rate for the first half is near 1%, a full 1.25% light of our full-year expectation. To hit our initial forecast, we would need to see real growth of 3.5% through the second half of the year. This would be a tall order, but not impossible. A recent uptick in our WCA Fundamental Conditions Barometer provides some reason for optimism that the second half will, at least, be better than the first. 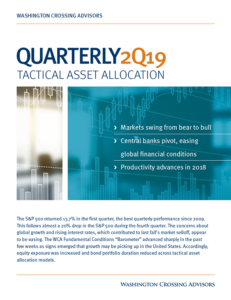 Ultimately, the direction is what is most important, and there are some things to cheer in this regard looking at the second quarter’s performance. 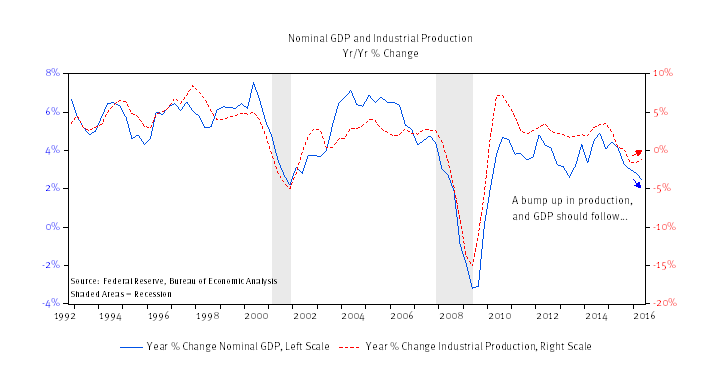 The slide in industrial production, which accompanied the slowdown in growth, seems to be easing (Chart A below). 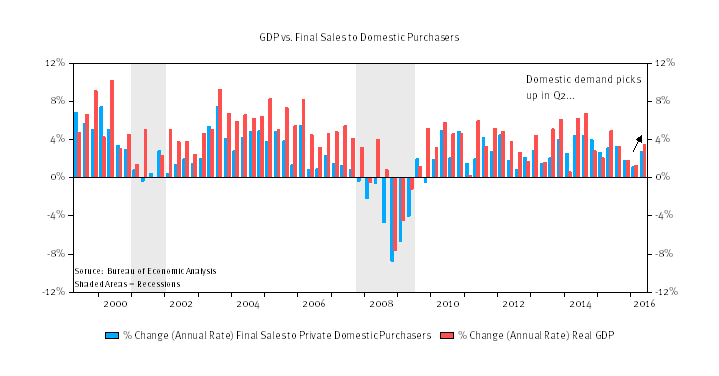 Domestic demand, measured by final sales to domestic purchasers, saw a pickup in the second quarter and helped drive the small improvement in total output (Chart B, below). Capital goods orders, a proxy for business investment, appears to be stabilizing. What we haven’t seen yet has been a pickup in investment (Chart C, below). Gross private investment contracted at an annualized rate of nearly 10% in the second quarter on an annual basis. The decline in overall investment was accompanied by a decline in private, single family residential investment (-16% annualized). Perhaps something to consider here is the fact that the average price of a new home in the United States is up 50% from the recession low and 20% from pre-recession levels. Could affordability, once again, be an issue? Ultimately, the economy remains on an expansion path. Although slow, the steady progress in the United States is better than many countries around the world. Combined with slower growth in the workforce, investment, and productivity growth, there seems to be less slack in the economy. 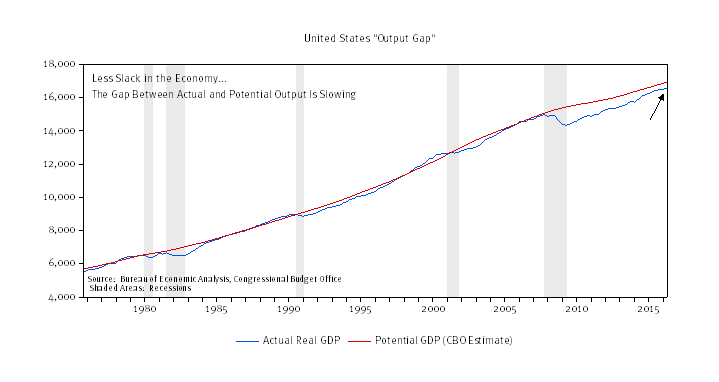 The “output gap” is narrower now than any time in the recovery to date, according to estimates from the Congressional Budget Office and the Bureau of Economic Analysis (Chart D, below). 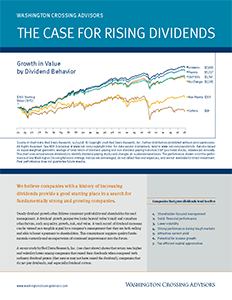 Firming prices, coupled with less slack, form the basis for the case for rate normalization. Core consumer prices are up 2.4% over the last 6-months, annualized). The market cap for U.S. stocks is near a record $25 trillion. The S&P CoreLogic Case-Shiller U.S. National Home Price Index is back near record levels. Overall, the ratio of household net worth (i.e. 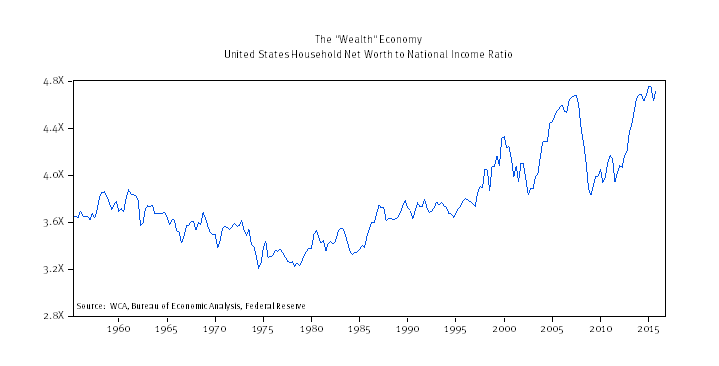 “wealth”) to national income is back to levels seen before the recession (Chart E, below). A narrowing “output gap,” above 2% core consumer prices, and a restoration of financial wealth all argue for rate normalization. As for the official data on the economy’s growth, we are pleased to see some forward progress and expect this progress to continue into the second half.